Several investment experts have recently resurrected the debate about how many UK income funds are reliant on just a small selection of stocks to deliver their dividends. Among them is Robin Geffen, the founder and chief executive of Neptune Investment Management and manager of Neptune Income (B8JCR45), who says just 20 stocks account for 57% of the UK Equity Income fund sector’s total dividends. He reckons many of these stocks could be forced to scale back their payouts when rising interest rates put pressure on their earnings. This undermines a key advantage of investing for income through funds – namely that through buying a fund with multiple holdings you reduce the risk of your income taking a big knock if one or two companies cut or cancel their dividends. Not all income funds are so heavily exposed to a handful of big dividend payers. Some will scour the market to identify lesser-known opportunities. Investing in these funds may provide more effective diversification for investors. Steered by noted small cap enthusiast Gervais Williams and his colleague Martin Turner, LF Miton UK Multi Cap Income (B41NHD7) is invested in the likes of FTSE 100 oil stocks Royal Dutch Shell (RDSB) and BP (BP.) but a large portfolio upwards of 120 holdings means it is not too reliant on these dividends. It has a track record of success, placing at the summit of wealth manager Sanlam’s White List of top-ranking equity income funds for the last three years. In order to come up with this list Sanlam examines the previous five individual calendar years of performance, five-year levels of volatility and the total dividend income distributed over the five-year period. Each of these metrics is weighted using a consistent formula, ranked individually, and then used to identify the funds with the best combination of performance, volatility and income paid. Another White List constituent which offers genuinely diversified income is SLI UK Equity Income Unconstrained (B1LBSV5). Although it has a smaller number of holdings at 61, the fund has a significant weighting to mid-cap and small-cap stocks which makes it less reliant on some of the big FTSE 100 dividend payers. Nearly 60% of the fund is invested in the FTSE 250 and FTSE Small Cap indices. You don’t have to restrict your horizons to traditional open-ended funds. 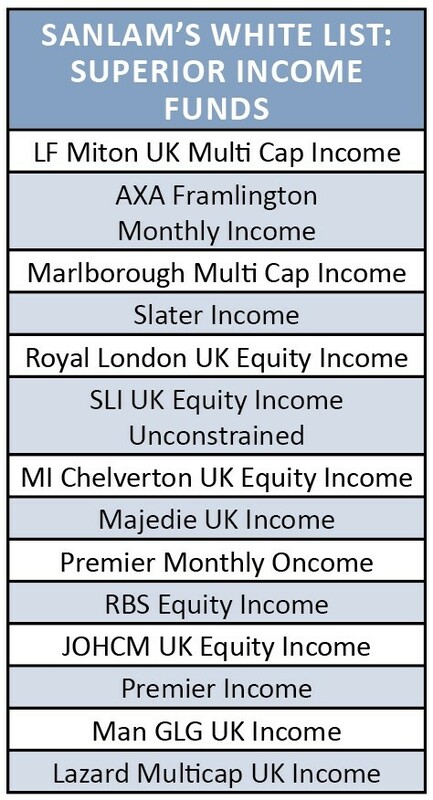 Investment trusts are another option and their structure helps reduce the risk of dividend disappointment (see ‘How different types of fund pay out income’). 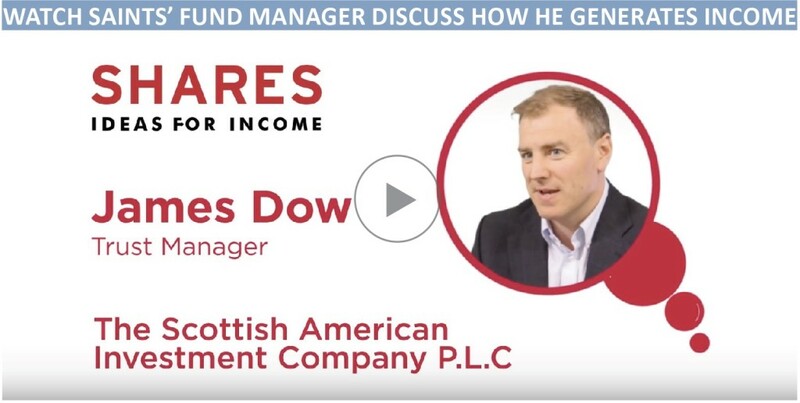 Run by Baillie Gifford’s James Dow and Toby Ross, the Scottish American Investment Company (SCAM) – also known as SAINTS – yields 3.1% and has a strong income track record underpinned by investments in international firms. The most popular types of funds are unit trusts and open-ended investment companies (OEICs). These receive the income on the underlying assets, such as dividends, bond interest or rent, and then distribute it on a regular basis. Some funds pay out once or twice a year, others do it quarterly or monthly. Another option is an investment trust. Unlike their open-ended counterparts they are not required to pay out all of the income each year to investors. This allows them to hold back some of the money so that they can smooth future dividend payments to help produce a steadily increasing stream of income, or maintain dividends in tougher times. Can Jack’s work its magic as Tesco’s new discount chain? The big decision: cut your losses or hang on in hope of a share price recovery? Trade War: How could it impact your portfolio? Can shares in tobacco companies fight back after a torrid time?